Rewards totaling $50,000 are now being offered as the search for suspects continues as reported during Action News at 10pm on August 9, 2018. CAMDEN, N.J. (WPVI) -- Rewards totaling $60,000 are now being offered as the search for suspects continues in the shooting of two Camden police detectives. The Fraternal Order of Police is offering a $30,000 reward, while the New Jersey State PBA is offering a $20,000 reward. In addition, Executive Director Joseph Occhipinti of the National Police Defense Foundation "Safe Cop Program" has announced the posting of a $10,000 Safe Cop Reward. Police are seeking two men who fled the scene in a white van. Meanwhile, both detectives shot in what authorities say was an ambush attack have been released from the hospital. The two plainclothes Camden County detectives were sitting in their vehicle at a red light in Camden when they were shot Tuesday night. Authorities say at least one gunman fired anywhere between 10 and 25 rounds at the pair. One of the detectives was able to return fire, but it's not clear if anyone else was shot. Scene of police shooting in Camden, New Jersey on August 7, 2018. A male detective shot in the bicep and forearm was released from the hospital Wednesday. 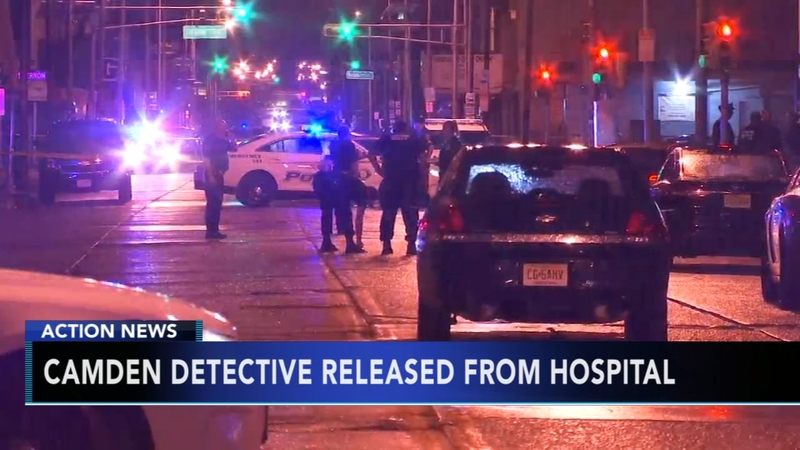 A female detective shot in the hand remained hospitalized Thursday but should be released soon. Anyone with information is asked to call 856-757-7042.